Readers learn that there’s so much more to our physical uniqueness than just our fingerprints or DNA – faceprints, knuckleprints, voiceprints, smellprints, and even bumprints could help unlock our homes, computers, and futures. Imagine starting your car by gazing into a scanner embedded in your rear-view mirror or giving the bank machine a high-five to get some cash. It’s possible, it’s out there, and it’s bound to be everyday technology for our youngest generation. We’re drawn into each chapter as it breaks down the recognition software and technology by explaining the method, challenges, and reliability of the data, and then ignites the imagination by explaining where you might find the biometric today and in the future. The book also addresses the implications of identity theft and importance of privacy, offering great depth while managing to keep the reader engaged with Birmingham’s expert delivery. Ian Turner’s illustrations delight, particularly the anthropomorphized computer that detects odour passwords. 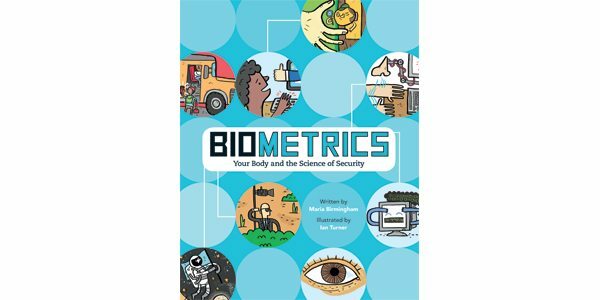 Biometrics would be an excellent study guide for an inspired science-fair project, and equally effective as a read for young tweens needing a reminder of their wonderful uniqueness.